The iOS SDK simulator can render an app's images, user interface controls and text at the resolution of both the existing iPhone/iPod touch (320x480) and the new iPhone 4 (640x960). The detail photo shown below, provided by an iOS developer, presents both images at the same scale, illustrating the difference the higher resolution density makes in text clarity and graphics. 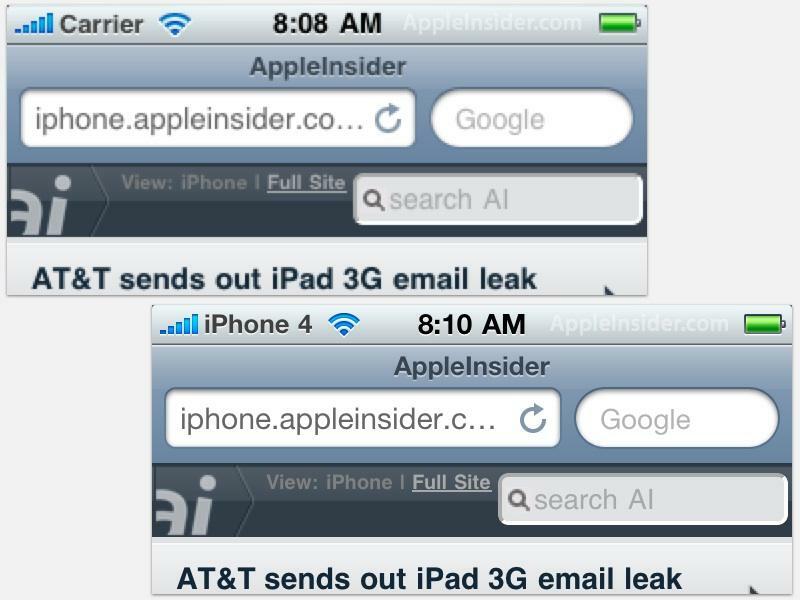 Note that bitmapped images created at the iPhone's exiting resolution, including the "ai" logo and the "search AI" field in the AppleInsider mobile web page (shown below), are not affected by the increased resolution and will need to be updated to appear as sharp as the native controls used in the Safari app. 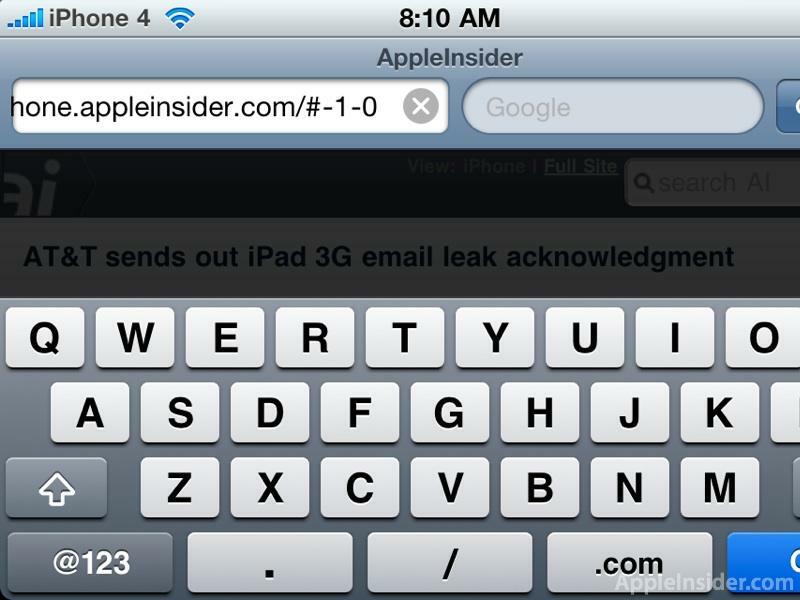 Text and vector images are rendered at the full resolution, however, without any work by the mobile app or web sites. 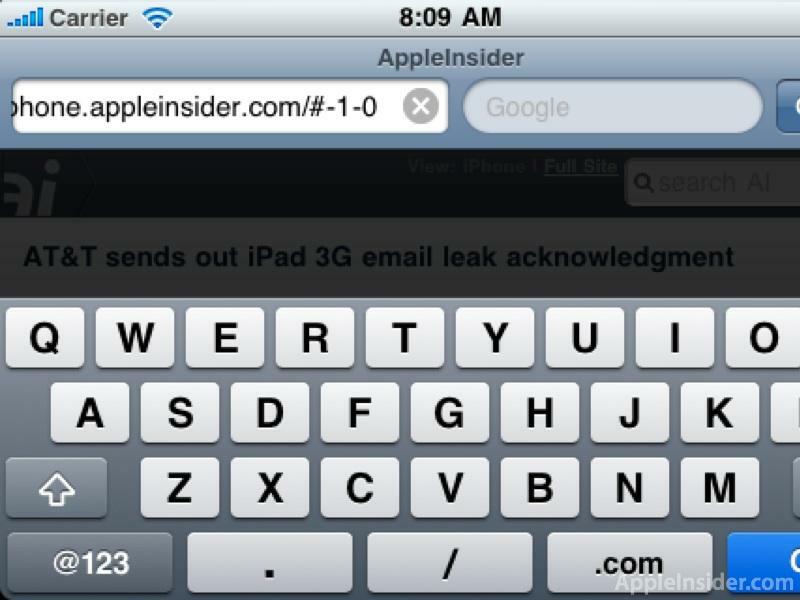 This capture of Safari operating in landscape orientation with its keyboard visible shows off the additional clarity and sharpness delivered by the iPhone 4's new display. The iPhone 4's 326ppi TFT Retina Display leapfrogs existing high end Android phones with resolutions of 480x854 TFT (Verizon Droid, 265ppi) or 800x480 OLED (Nexus One / HTC Incredible, 254ppi, but drops pixels to deliver an effective subpixel resolution of 392x653) or 480x800 TFT (HTC Evo, 217ppi due to being a larger screen). While a large number of the more than 50 million existing iPhone users worldwide are likely to upgrade to the new iPhone 4, Verizon and Sprint users who just signed two year contracts on Android phones in the last six months are unlikely to race out to buy the next higher resolution devices that become available, particularly given that US service providers are now forcing users to pay as much as $350 in early termination fees.